Congratulations on reaching level 50 and beating Star Wars: The Old Republic! Not so fast! For some, reaching level 50 is just the beginning of what is known as the ‘end game’ content. I’m sure you’ve heard those words tossed around or perhaps you haven’t but it is known as ‘raiding’ or, to be more specific, ‘Operations’ in the world of TOR. This is the subject that many people get up in arms over and, while we can go into that subject a great deal, I’ll leave it for another time. Today I’d like to talk about how does one get ready for an Operation in terms of gear. You don’t need to be decked out in epics to do well but there is a certain minimum threshold that needs to be met in order to be successful. A good player can make up for lacking some gear but when you’re getting hit with high damage attacks from the Annihilation Droid hard mode then it helps if your health pool isn’t 15,000. PVP gear used to be an acceptable way to get gear good enough for operations but with the changes that were made in 1.2 this option doesn’t really exist. The recruit gear that you can purchase as a fresh 50 doesn’t have the stats you need to do well in operations but they still can be used to fill in a few pieces you may be missing. Hopefully you’ve been participating in the PVP War Zones because nothing prepares a player for situational awareness better than the paranoia of being ganked out of nowhere. PVP forces you to always look over your shoulder at the world around you so that when you are in an Ops group noticing that red circle on the ground that you’re not supposed to stand in becomes easy. ~300,000 credits for a full set! The most obvious way to get gear is by running Flashpoints, especially in the hard mode setting. Many of the boss fights mimic mechanics you will see in an Operations boss such as moving out of targets on the ground, line of sighting (or LOS) the boss or running out of a group if you get targeted for an AoE explosion to name a few. The hard mode Flashpoints will even drop Columi level gear you would get in an Operation to give you a bit of a head start. The easiest you may want to start with is The Black Talon/The Esseles which can be done relatively quickly. 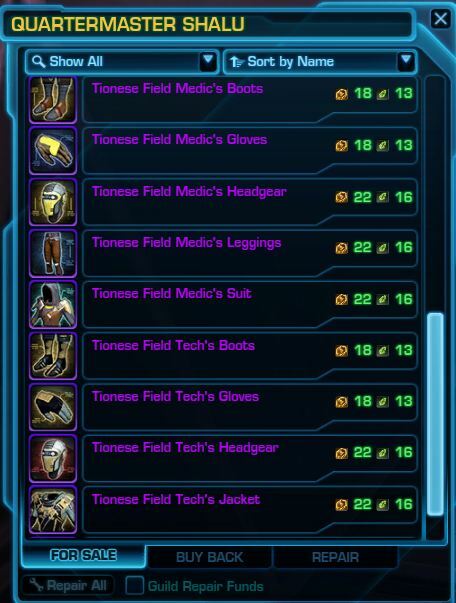 Not only do you have an opportunity to win a set of Columi level bracers but you also pick up Tionese commendations and crystals which you can buy Tionese gear from the fleet vendor. Other hard modes drop hands, feet, legs, chest, head and an offhand so it’s possible to get your set bonuses without having to set foot in an Operation. The hard modes can be a bit challenging at first so you might consider running the normal versions first. Tionese gear is a good place to start. Get those set bonuses! Everyone loves doing daily quests, right? Well if you do (weirdo) then finish up your class quest to unlock the daily quests on Ilum, Belsavis and the newer Black Hole area. They award Daily Commendations which can be used to purchase item modifications and gear. Don’t forget about the top level space mission which awards Daily Commendations as well. This method is a bit slow but if you’re determined enough you can get some pretty decent pieces and item upgrades for your orange gear with these commendations. You’ll also find that the credit rewards are quite lucrative which leads to my next method. They say money can’t buy happiness but it certainly can buy you the gear you need to do an Ops. 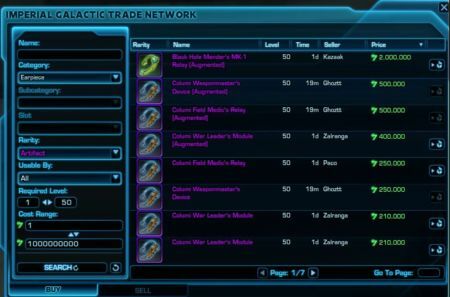 If you find yourself swimming in credits then the Galactic Trading Network is a good place to gear up. Sure it won’t teach you any fight mechanics but if you just hit 50 and your operation starts in an hour then buy your way in! This is not the most ideal way, but if you’re in a pinch it’s not too bad to round out any gear that’s lacking whether it be from item modification pieces or buying the crafted epics that are sitting out there. Be warned though, some people are pretty proud of their stuff so you may be broke by the time you’re finished. Buy your gear troubles away! These methods are probably the easiest and fastest ways to gear up to run an Operation but there’s certainly other ways that to get the gear you need that I haven’t gone over. 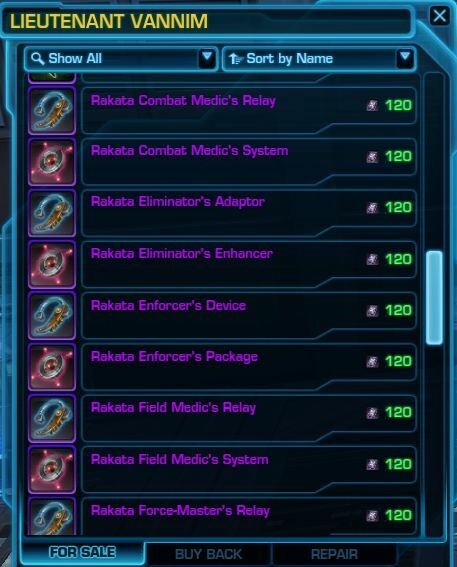 Matrix crystals from datacrons and even some vendor purchases are suitable enough to get you going. The important thing to consider is that gear is only part of the equation. Learning the fights and learning how to play your character correctly hold a big part in being successful. 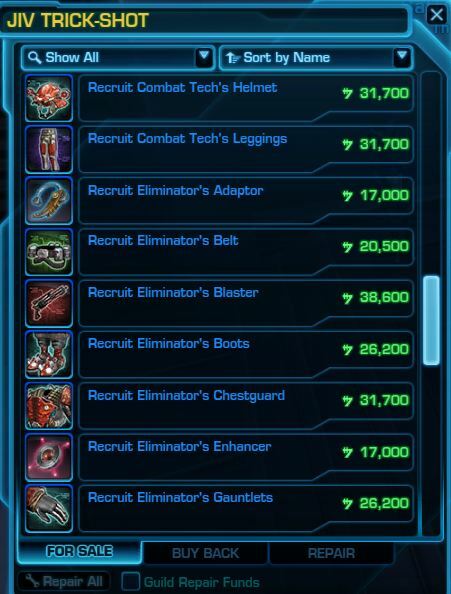 No boss in SWTOR is going to drop dead and give you gear just by clicking a few buttons… with the exception of the Ancient Pylons encounter. You’ll see what I mean when you get there. 🙂 The rest of it will require teamwork, communication and everyone performing their roles properly to get the job done. The main thing to remember is that this is still a game so have fun! Thanks for the comment, Adaram! You should definitely have separate sets for PVP and PVE in the end but there’s nothing wrong with mixing and matching. You’d be surprised how fast you can gear up once you start doing operations, especially if you have experienced people to help you along the way. Good luck! Useful guide. With 1.3 coming tomorrow, does it change something for gearing up at level 50? Hopefully you’ve been participating in the PVP War Zones because nothing prepares a player for situational awareness better than the paranoia of being ganked out of nowhere. PVP forces you to always look over your shoulder at the world around you so that when you are in an Ops group noticing that red circle on the ground that you’re not supposed to stand in becomes easy. HoloNet Links Episode 62: Update 1.3 Allies Live June 26th!